Saturday lunchtime bought déjà vu to the eyes of Villa fans after taking the lead in a game before losing 4-1. I believe however that the media and pundits have been a little harsh on the Villa because of course they were against United. We were the better team for a lot of game squandering many chances. But let’s face it; it’s what Villa does best… gift United 3 points. Although the performance was much better and more promising than against Stoke (this wasn’t exactly hard) the team still lacked a lot of quality. The defending to was beyond a joke with the back staying in a flat four with no depth making it way to easy to get through. We can’t even use the age old excuse that United get all the decisions at Old Trafford; I mean that penalty was more stonewall than Hadrian’s Wall. The one slight positive from the game came from the little general in midfield, Ashley Westwood. He capped the great start made by the villans with a beautifully stroked free kick into the corner of the net; which came as a bit of a surprise to me, as I didn’t realise he possessed this skill. The little conductor would have had a beautiful assist too, if Benteke wouldn’t have decided to leave his foot-eye co-ordination at home. Throughout the season Westwood has been the calm head of the midfield next to Delph and KEA. You can really see when Westwood is off the boil or out the team as the middle of the park is less organised, with it looking somewhat rushed and erratic. He goes about his business so efficiently and quietly that he is to some extent the forgotten man in the Villa team. In the wake of the hype of Delph, this has been justified mind. Lambert certainly thinks the conductor is key; ‘Westy doesn’t get the credit he deserves because he keeps everything simple,” said Lambert. “His rise to the Premier League has been huge and he’s done consistently well for two years now. The great thing is he’ll get better. His performances have been excellent’. So I think PL will join me in congratulating Ashley ‘the conductor’ Westwood in awarding this honourable award of Villa’s Proper Man of the Week. Stat of the Week: With Westwood creating a massive 53 chances this season with a pass completion rate of 84% which is very impressive considering the amount he has the ball. This was difficult this week to decide between a couple of brilliantly awful candidates. Therefore I thought it would benefit the team as a whole if both players were given this award. First off, it’s perhaps unfortunate timing, as the first recipient’s season was cruelly ended today through injury. Benteke seemed to put both his left boots on at Old Trafford. Three absolute golden opportunities which most Sunday League strikers could put away and at worst, even Emile Heskey would have even fancied his chances. The air shot was beyond belief and the free header from a player so good in the air, shocked me even more. All these chances came at a time when the game was hugely in the balance and the tension at the ‘Theatre of Nightmares’ was also on a knife-edge. However, like the great commentator Michael Owen (sense my sarcasm there) once said ‘it’s not missing sitters you have to worry about; it’s when you stop getting in positions to get those sitters’. And I tend to agree with him so let’s not worry too much, although we’ll have to wait for the big Belgian to make amends. In the mean time, we wish him all the best in his recovery. The second person to receive this award is Ciaran Clark, who has simply not improved enough to warrant a place in the team. One of the many Villa academy graduates that has shown great promise, but hasn’t made that final step to become Premiership quality. Lets not forget, he was at on stage mooted as the future full-time Villa captain. Yes, his left foot is decent and he isn’t too bad in the air, but his reading of the game is so bad that it is like a five-year-old trying to read War and Peace. He doesn’t have the required pace to counter his bad positioning and reading of the game either, so it is a recipe for disaster. The Rooney equaliser is a perfect example. He followed the decoy run which was already being tracked, and like a lost puppy left his man (Rooney) wide open the middle, who then guided the ball into the net. So unfortunately, I feel he has to be sold in the summer and cover needs to be bought. As Villa fans, we also need to hope that Okore is as close to fitness as has been reported and hope he lives up to his promising start to the season. Lets also pray that despite the loss of Bentke, the rampant Villa of two games earlier turns up on Saturday and we turnover a sinking Fulham team. Who was your Aston Villa player of the week? Comment below. 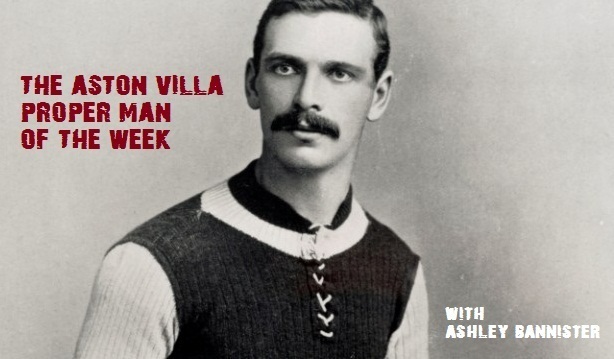 *The column picture features former Villa skipper John ‘Jack’ Devey pictured here in 1895. As well as captaining Villa and being capped for England, he was also a top cricketer for Warwickshire, a decent baseball player, cyclist and runner. An all round proper man! ‘Proper man’ – copyright, Paul Lambert. Slightly off the subject (sorry), but I went to see the U21’s v WBA U21’s on Monday and Callum Robinson must be worth a start or at least a good 20 minutes at the end after scoring 2.